DRY-CLEAN (dri’-klen) Vt. To clean (clothing, etc.) with solvents other than water, such as carbon tetrachloride. 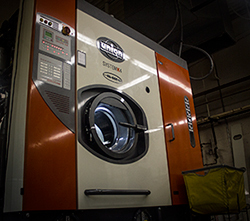 Dry cleaning is very similar to washing, but a solvent is used rather than water. The solvents used before 1930 were typically like kerosene or gasoline. Drycleaning a garment would look almost like washing it in a front loading home washer, but rather than water, the washer would have a liquid solvent in it to clean the garments. Professional garment care goes back to ancient times, probably beginning with the advent of textile clothing itself. The ruins of Pompeii give us a record of a highly developed trade of “fullers,” who were professional clothes cleaners. lye and ammonia were used in early laundering, and a type of Clay called “fuller’s earth” was used to absorb soils and grease from clothing too delicate for laundering. There are many stories about. the origin of drycleaning, all centering on the supposed discovery that when a petroleum-type fluid was accidentally spilled on a greasy fabric it quickly evaporated and the stains were miraculously removed. The firm of Jolly Belin, opening in Paris in the 1840′s, is credited as the first drycleaning firm. In those early days, “garment. scourers and dyers” found several fluids that could be used as drycleaning solvents, including camphene, benzola, kerosene, and gasoline. These solvents are all dangerously flammable, so drycleaning was a hazardous business until the introduction of Stoddard solvent in 1926, the first petroleum solvent produced specifically for drycleaning. This solvent does not, ignite readily and has the added advantage of being free of odor and impurities. In the 1930′s perchloroethylene, a nonflammable solvent, was introduced and is still used today in many drycleaning plants. Oak Forest Cleaners is the first dry cleaners in Arkansas to switch to SolvonK4. It is a completely non-toxic, halogen free organic solvent with a pureness of >99%. It has excellent cleaning performance and leaves your clothes feeling smooth and it is also odor-free! There is no real mystery about drycleaning. Dry cleaning is simply the use of a solvent to remove soil and stains from a fabric. It is called drycleaning because the solvents contain little or no water. 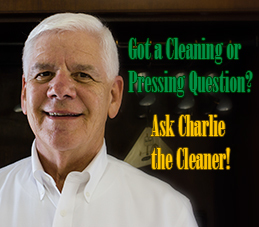 So when you think of drycleaning, don’t think of mysterious powders. Think of Oak Forest Cleaners.